Fourteen Wall Street, situated next to Federal Hall and across from the New York Stock Exchange, is a historic landmark offering unique retail and office spaces and unparalleled building management in the heart of the Financial District. 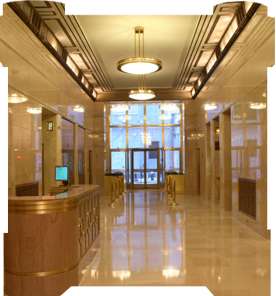 While seeking to preserve the building�s neoclassical design, the owner seeks to reinvent the building in a way that is in line with the needs of modern-day tenants. 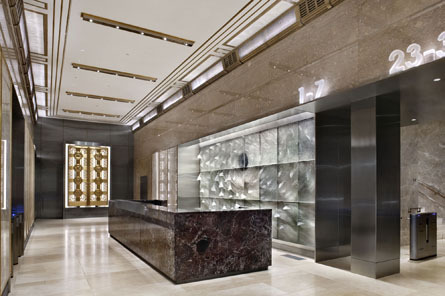 With a major capital improvement program that includes a reinvented lobby with state-of the-art security, newly redesigned common areas and upgraded critical systems, Fourteen Wall Street offers the ultimate modern business environment. To suit the wide-range of tenants� needs, availabilities include a wide range of sizes with superior pre-built, built-to-suit and raw space ready for build-out options. With on-site management designed to anticipate and swiftly address the needs of tenants and visitors, the owner and management team seek to create long-lasting relationships in order to retain existing tenants and attract new tenants of the highest caliber. With a committed and hands-on management team involved in all aspects of the building�s operations, Fourteen Wall Street remains a distinctive choice for tenants worthy of its distinctive and historic design.